With luck, this will reach you before I’m missed. Time comes when a man has to rattle his fortune and see what shakes out, so says my new fast friend, and by God, with my lungs filled with sea air, the salt spray in my face, I reckon he’s right. 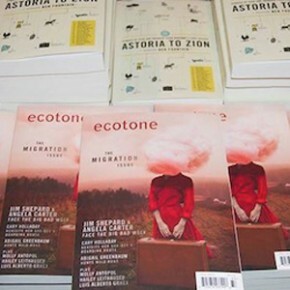 Excerpted from “The Wreckers” from Astoria to Zion: Twenty-Six Stories of Risk and Abandon from Ecotone’s First Decade. Copyright © 2014 by University of North Carolina Wilmington. Used by permission of Lookout Books. All rights reserved. No part of this excerpt may be reproduced or reprinted without permission in writing from the publisher.